Consuming more seafood is a smart way to improve your diet. The American Heart Association recommends eating at least 2 servings of fish a week to get enough heart-healthy omega-3 fatty acids. Salmon is a great source of these healthy fats, and is easy to prepare at home. These delicious salmon kebabs are marinated in a simple mixture of garlic, dill, and lemon and then grilled for a quick and easy dinner you can make on weeknights. A lemony Greek yogurt dipping sauce with dill tastes great with the salmon kebabs, and can be stirred together quickly while the salmon cooks. Serve these salmon kebabs with a green salad or grilled veggies for a fresh and delicious meal. Remove skin from salmon with a sharp knife (or ask the butcher at the grocery store to do it for you) and cut salmon into one-inch cubes and place in a small non-reactive container. Stir together garlic, dill, lemon juice, olive oil, and pepper. Pour over salmon and marinate while grill heats. If using wooden skewers, soak them in water. Heat grill or grill pan to high heat. Thread salmon onto skewers. Lightly oil grill grates and place salmon kebabs on grill. Cook kebabs 3 to 4 minutes per side, rotating so that all sides get contact with grill. While salmon is cooking, whisk together yogurt sauce ingredients. 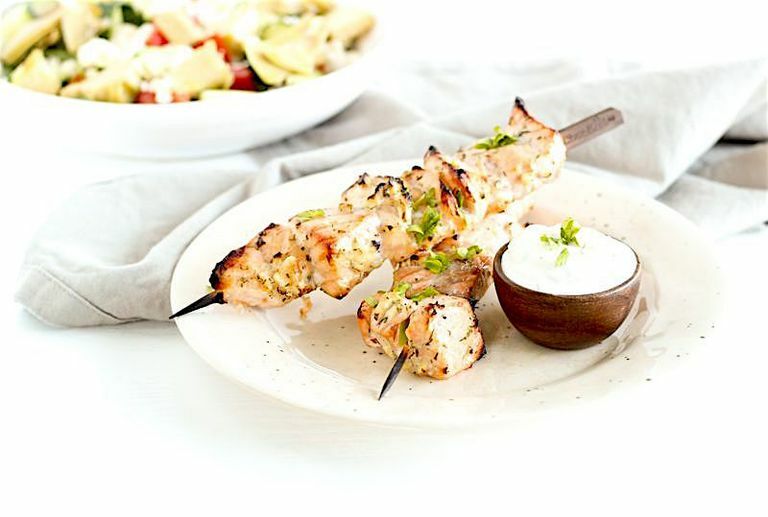 Remove salmon kebabs from the grill and serve with yogurt sauce. You could make this recipe with chicken or lamb if you wish. They won't offer the omega-3 fatty acids that salmon does, but you'll still have a protein-rich meal. You can substitute fresh dill for dry, using half of the amount called for. Skin will be easier to remove if fish is frozen. Just run a thin, sharp knife between skin and flesh. Serve with a green salad or grilled vegetables and cooked quinoa for a healthy, balanced meal.